OSS Nokalva Home Page > Resources > ASN1.IO > Dynamic > Why DCodec? Message exchanges are a ubiquitous part of our daily lives and surroundings. All messages, from simple ones, such as signaling that you switched ON a light, to complex ones, such as a mobile device handover from one cell tower to another, are composed and parsed according to a definition. Initially, a protocol structure is defined “casually” in your application data model (i.e. without a formal schema). Later, as the protocol grows in complexity, you move towards a more formal schema. This typically implies a more “rigid” way of handling messages, where deviations from the schema-defined structure are not acceptable. However, in many communication scenarios, you want to handle schema deviations without breaking the communication. What if you could enjoy the best of both worlds, i.e., preserve the JSON-like flexibility you are used to, while taking advantage of the power of a schema? All this with an added bonus of an easy transition to binary, should you need it. If you wonder whether you should develop your own encoder/decoder or use an existing one, consider the following. Paraphrasing the above: "any project that includes writing an encoder/decoder, becomes, de facto, an encoder/decoder project". OSS’ DCodec makes prototyping and deploying a communication software much easier. Here is a list of tools that may jumpstart and help us with our project. The tools are built around JSON, where the DCodec is one of them. Json2csharp - generates C# classes (aka bindings) from JSON. 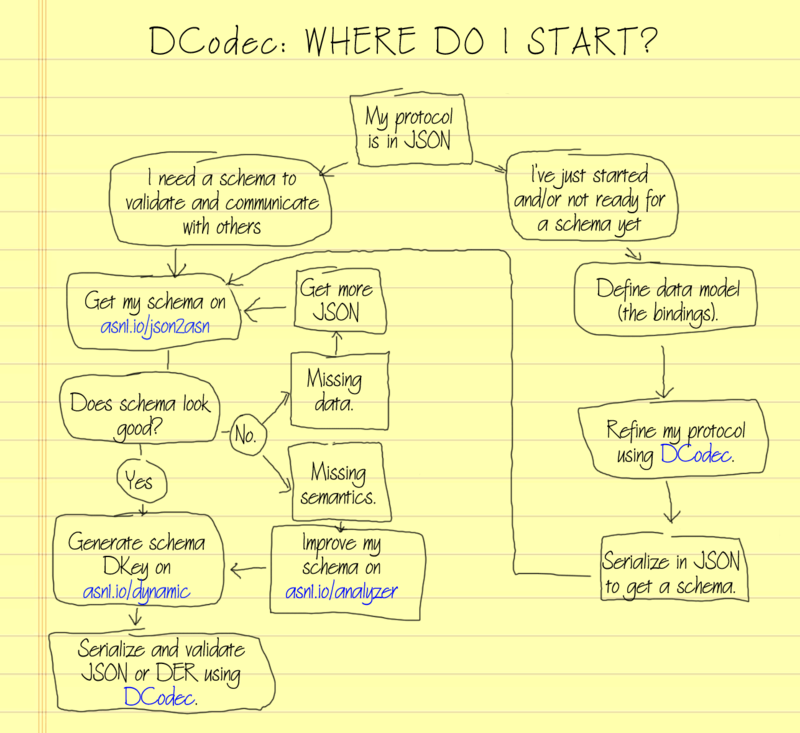 DCodec - can serialize JSON, allows great flexibility and data validation (against a schema), also can go binary (DER). Json2asn - creates a schema from a JSON message. Let's say we develop an app that receives JSON messages to control a sensor. For simplicity we have just two kinds of messages: a sensor reading (outgoing) and sensor configuration (incoming). Use json2csharp to create bindings. Improve the bindings manually (just a bit). What if we communicate with a sensor of an older model, which sends us data that do not conform to our model? It would be helpful to check its messages beyond just JSON well-formedness, i.e. to understand if the message has the expected fields and types. We can do this kind of validation with a schema, which defines the data structure, the field types and value ranges. The DCodec uses a schema, which can be obtained at JSON2ASN from the same JSON that we already learned how to communicate with. This is an ASN.1 schema. ASN.1 is an international standard used by many companies in telecom, avionics, intelligent transportation systems, etc, basically anywhere where robustness and security are important. Most likely we’ll need to modify the schema manually, a little bit. In this case by replacing the UTF8String with a different type - ENUMERATED. Next, we compile our schema into a key (or DKey) using this schema key generator. DKey can be loaded and used to validate our data by the DCodec. Every time when the message is encoded or decoded, it can be checked against the schema (say, for a missing a field or an integer range) so the DCodec will notify us of the invalid data. Now let’s say we need to add new field in the sensor reading. Using the DCodec and schema there will be no problem with compatibility between our already deployed sensors and our newer sensors. Devices that use the old schema will be able to decode the new messages (simply ignoring the parts that they do not understand) and vice versa.The DCodec can notify the app about any conflicts when there is a mismatch between the JSON, the schema and the bindings.This gives the DCodec great power in handling your communication with different versions of your devices and offers a flexible conflict resolution method by letting the app to choose whether to accept a message with deviations or not by responding to continue (DResponse.Continue) or to stop the decode process (DResponse.Break). Depending on the scenario you are trying to address, it might be useful to pre-define a class-based model (a static type) and parse the JSON data directly into it, or it might be better to use dynamic types (created dynamically based on the input data). Static types are the preferred choice for cases when you need to use all the data, or rather when the ratio between the useful data and the total data is large. Static types offer the advantages of error checking at compile time and intellisense. Dynamic types, on the other, hand shine when used on large datasets, when you don’t need all the data and just want to extract some information from each structure in the JSON message, or where you don’t have the need or time to write up a class structure to fully model the data. Let’s look into that in a bit more detail. The most straightforward way to parse JSON data is to use a data model structure and bind the JSON message structure to it. This is very useful in situations where you know what data to expect and you don’t need to dynamically add new data, and also when you expect to consume all (or most) of the data. You can write our own data model by hand or you can use a series of freely-available online tools to generate a data model structure by giving an exhaustive set of JSON messages (the properties contained in the JSON messages must cover all the cases, otherwise the missing properties are not generated). In case you are not interested in all the data contained in the JSON message, you can omit or remove the members you don’t care about, and they will not be decoded from the JSON message. Dynamic types are very useful in the situation where you don’t care about all the data, don’t have a consistent schema for the data you are not interested in, or simply when you don’t need to write a class structure to model the parsed data. Take the following example: while parsing a Google Maps Places API to get all the business places around an app’s location (example can be found here), we get a lot of information in a JSON file. Most of it is not of interest to the application, so we need only to parse out and process the information we need. Using dynamic types (supported by the DCodec) we can very simply access only the properties we are interested in, and ignore the rest. So, as you can see, the dynamic types are very versatile and can handle all the situations you might encounter while working with JSON messages with the least amount of effort.